One of UNIGLOBE One Travel's Cruise Specialists shares some interesting tidbits from an Alaska Cruise he recently set sail on. Whether cruising is on your list to try as a vacation, or you're already an avid fan of cruising, one of UNIGLOBE One Travel's Cruise Specialists shares some interesting tidbits from an Alaska Cruise he recently set sail on. Take advantage of the insights Eric has to offer both from a tourists' perspective and that of an Travel Consultant. 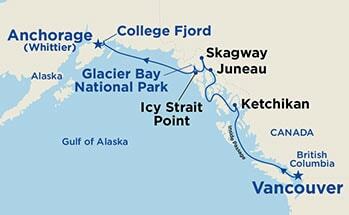 Departing from Vancouver, our first ports of call were in Ketchikan, Juneau and Skagway. Shipmates said the true beauty of these places is leaving them (the majestic scenery is stunning) and while this is partially true, as a tourist, I certainly wasn't against the many places to buy postcards, shot glasses, t-shirts, smoked salmon, etc. If you want to bring back souvenirs to remember the ports you visit, these ports have it all. There was a lot to be said of the beauty to be seen once we left the towns. 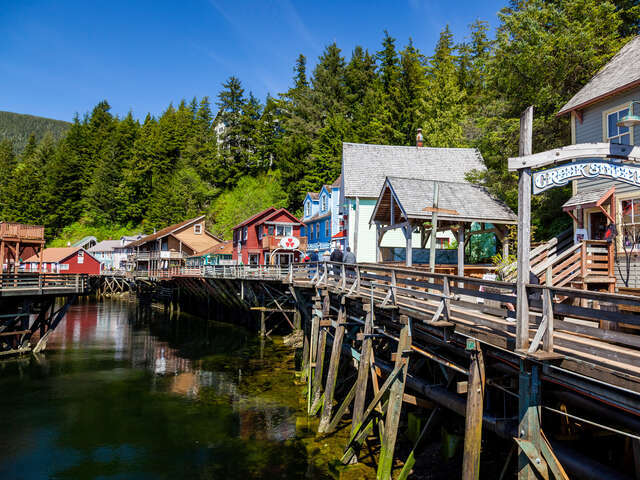 While time at Ketchikan port was short, there was still time to check out the town. Walking and shopping along Creek Street, bustling with tourists from other ships in port at the same time, was especially nice. The weather was cooperative, the sun was out and town merchants are clearly used to the volume of people exploring their streets. Some excursions can get rained out from time to time, so this is something to be aware of. We had 12 hours in port in Juneau and I really wanted to see the Mendellhall Glacier [this amazing glacier is 12 miles long, a half-mile wide and from 300 to 1,800 feet deep. 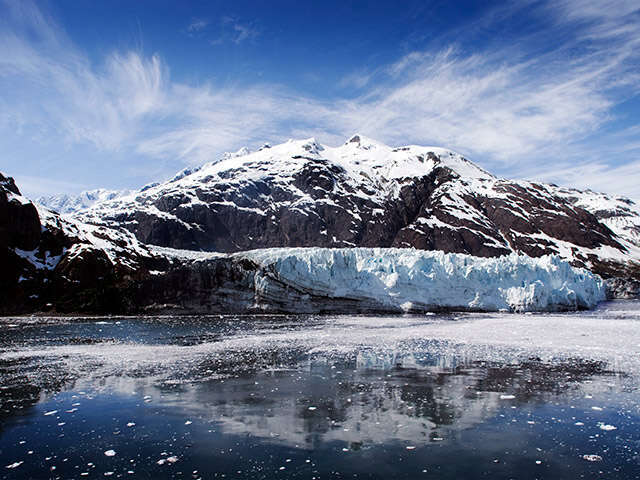 Stretching from the Juneau Icefield to Mendenhall Lake, it has been slowly retreating since the mid 1700]. This is something everyone should do when in Juneau! We also had time to tour the Alaskan Brewery and booked this excursion while at a store downtown. Be sure to save time for a trip to the Crab Shack, next to the pier. Although it can be on the pricier side, the meal was very tasty! In these small town ports, it's good to have an idea of what you'd like to see and do, as almost everything closes at 6pm. If the ship isn't scheduled to leave port until later, you may want to plan what to do in those last few hours in port. With so many excursions to choose, I recommend the White Pass Scenic Railway, as a must. This 3 hour tour goes by quickly and the scenery is amazing. 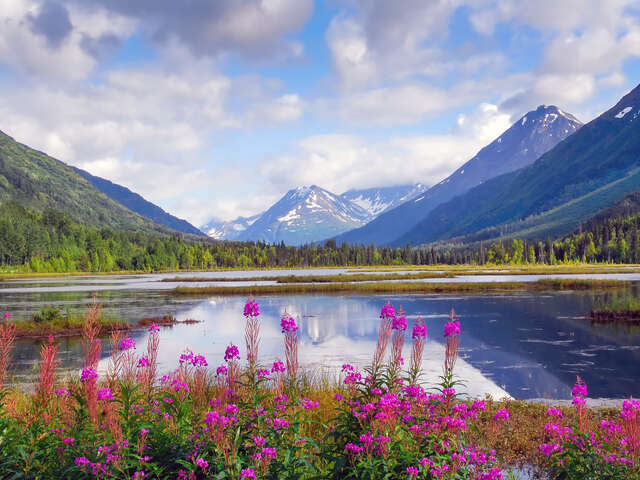 The tour links Skagway with Yukon, Canada and a 41-mile roundtrip offers an unforgettable journey to the summit of the White Pass at nearly 3,000 feet in elevation. Of course, a final amazing "must" component of this cruise were the Glaciers! 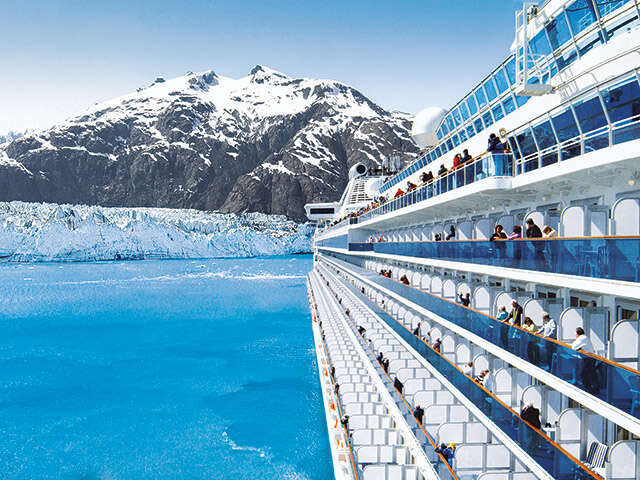 Many of my clients tend to want to wait until they are older to take an Alaskan Cruise, but my recommendation would be that now is the perfect time to go, while the glaciers are still tidal. These glaciers are receding at a rapid pace. A naturalist onboard showed us images from the 1980s and 1990s and it's amazing how quickly they are moving back. As great as the ports were on this cruise, "our home away from home", the Grand Princess, was equally as great. From the friendly and accommodating staff, to the balcony stateroom I was booked in - I had everything I needed to make my stay memorable. Relaxing in the Terrace "adult only section" Pool (only a short walk away) and being entertained by a phenomenal Irish duo at one of the many onboard activities, kept me busy at sea. I would also highly recommend at least one fine dining experience, in one of the many specialty restaurants onboard the Grand Princess. A wonderful way to enhance your cruise overall, if this piques your interest, be sure to make a reservation ahead of time. Specialty restaurants can tend to book up at the start of your cruise. As a tourist, I had everything I needed for an awesome vacation - and as an agent, I will recommend the Grand Princess to my future cruise clients! On a side note, speaking as a travel consultant, while the balcony stateroom was comfortable space for two of us, I would recommend the more spacious "Mini-Suites" to the "family" cruisers out there - its' 323 square feet offers more comfort spatially and it has a separate seating area with a sofa bed and balcony. As well, If you have a concern about motion or sea sickness, check with me - I can see what's available more in the middle of the ship. Mid-ship Staterooms are substantially more stable, as they are situated at the more naturally balanced point of the ship. If you are prone to sea sickness, I can research itineraries with fewer sea days, which allow you to spend more time on land. I could not have asked for better weather on my Alaskan Cruise. Because this is not always the case (50/50), it can be sunny and hot or cold and raining, my advice would be to prepare for anything on your trip by bringing lots of layers. The best time to book your cruise depends most on the destination you plan to explore. For this Alaskan Cruise, cruising between May and September are optimal for weather conditions and longer hours of daylight. These times are also optimal in coordinating with where cruise ships may be re-positioning for their next cruising season. Princess Cruises offers tons of shore excursions while you are in port. Exploring ports of call is one of the highlights of your cruise. Typically a variety of activities are available including many family/budget friendly options. Carefully selected and provided by reputable tour operators meeting the high standards of Princess - your security and comfort are important. Every effort is made to ensure that each tour operates safely. We can assist you to organize tours in advance so time in port is maximized and worry-free. Alternately, you can book excursions with Princess at check-in online, while in destination on the ship itself and at times even when you're out exploring the ports. 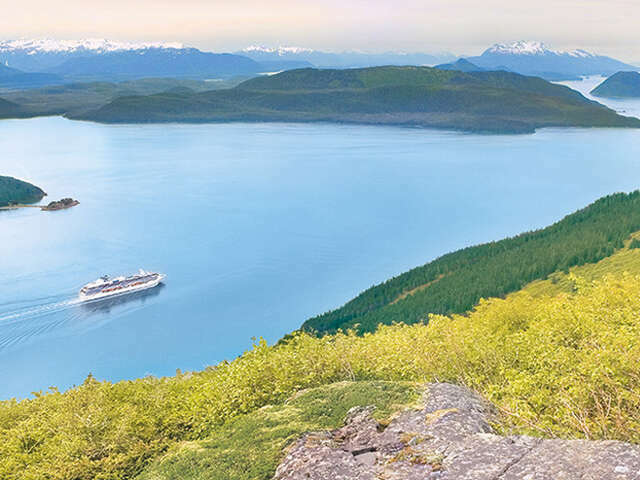 When it comes to an Alaskan Cruise, cruising only one way and flying back or booking a roundtrip cruise, are both great options. While a roundtrip cruise offers more convenience and spares travelers from flying home or to where the cruise sets sail - it can be limiting in what you can see or more importantly what you will not see. College Fjord was a huge part of my cruise and I would not have had a chance to see it on a roundtrip cruise. On a one way cruise, your final day, disembarking, perhaps sightseeing and then getting home, can be long, but worth the sights. Travelers can contact me to plan ahead ensuring their flights to or back from the cruise are as uncomplicated as possible. As a tourist AND a Travel Consultant, I had a fantastic time and would recommend this, and many other cruises, to anyone! There are cruises to suit virtually every travelers' wish. Choose where you are passionate about exploring and what you most desire to get out of your vacation. Whether adventure or relaxation is your end goal I can assist you in finding the best cruise ship and destination to book.